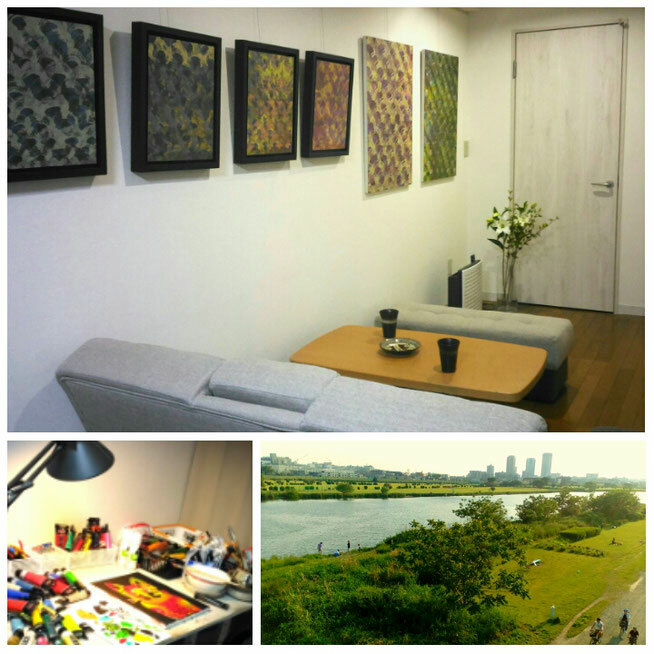 Artist KATO's art studio is situated near the Tama river. It takes twenty minutes to walk from Cube Gallery to the studio. They call it Gingerbread studio. 1954 Born in Tokyo, Japan. 1976 B.F.A. in Japanese style painting, Tama Art University, Tokyo. 1978 M.F.A. in Japanese style painting, Graduate School of Tama Art University, Tokyo. 25 solo exhibitions held in the USA, Japan, Taiwan, Thailand, China, and Vietnam. 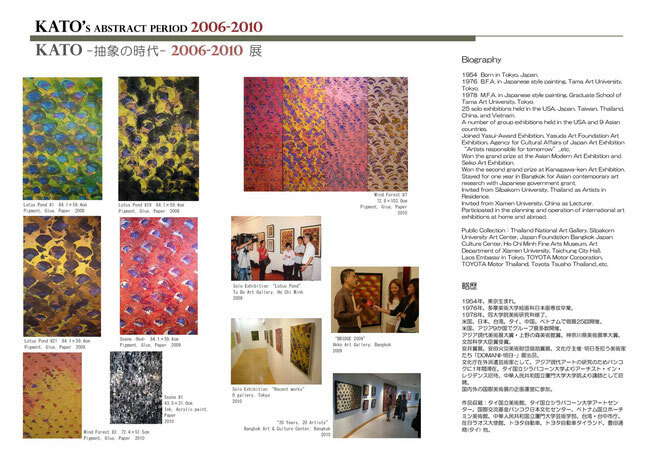 A number of group exhibitions held in the USA and 9 Asian countries. Joined Yasui-Award Exhibition, Yasuda Art Foundation Art Exhibition, Agency for Cultural Affairs of Japan Art Exhibition “Artists responsible for tomorrow”...etc. Won the grand prize at the Asian Modern Art Exhibition and Seiko Art Exhibition. Won the second grand prize at Kanagawa-ken Art Exhibition. Stayed for one year in Bangkok for Asian contemporary art research with Japanese government grant. Invited from Silpakorn University, Thailand as Artists in Residence. Invited from Xiamen University, China as Lecturer. Invited from Li Keran Academy of Painting in Beijing as Lecturer. 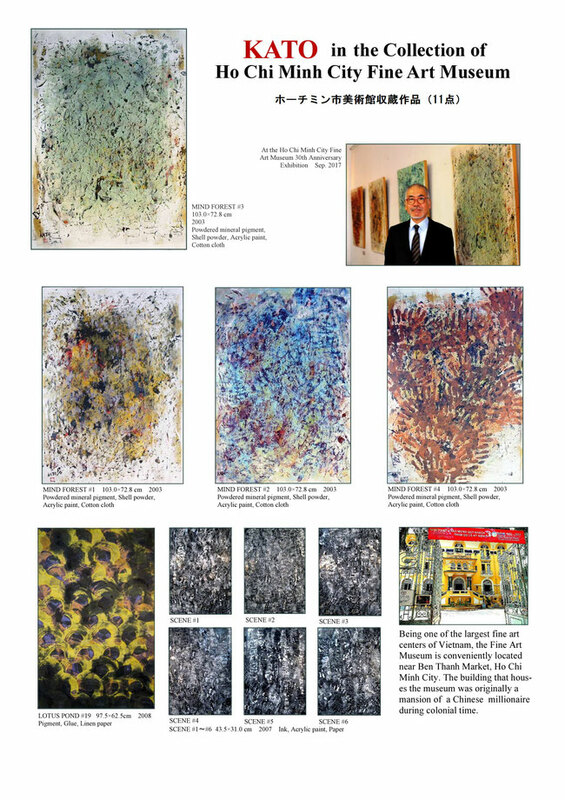 Participated in the planning and operation of international art exhibitions at home and abroad. Public Collection：Thailand National Art Gallery, Silpakorn University Art Center, Japan Foundation Bangkok Japan Culture Center, Japanese Embassy in Thailand, Ho Chi Minh Fine Arts Museum, Li Keran Academy of Painting Art Museum (Beijing), Art Department of Xiamen University, Taichung City Hall, Laos Embassy in Tokyo, Seisa University, Hoshino Resorts, TOYOTA Motor Corporation, TOYOTA Motor Thailand, Toyota Tsusho Thailand...etc. At the Ho Chi Minh City Fine Art Museum 30 th anniversary commemoration ceremony Lunch party. Together with Deputy Director Mr. Trinh Xuan Yen, the most influential person of the museum. 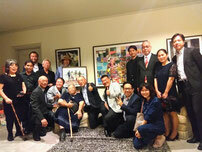 The artists dinner party of the Japanese Embassy in Bangkok. I contributed 4 pages of detailed article on the "Manthly Gallery" Octorber issue, one of the most famous art magazine in Japan. The opening of "CATS by KATO" at Akko Art Gallery in Bangkok. Mr. Hirofumi Sato, President of TOYOTA TSUSHO Thailand and Mr. Kazuhiro Fukuda, Director General of The Japan Foundation Bangkok cut the ribbon. With Ms. Ma Thanhcao, president of Ho Chi Minh City Fine Art Museum. 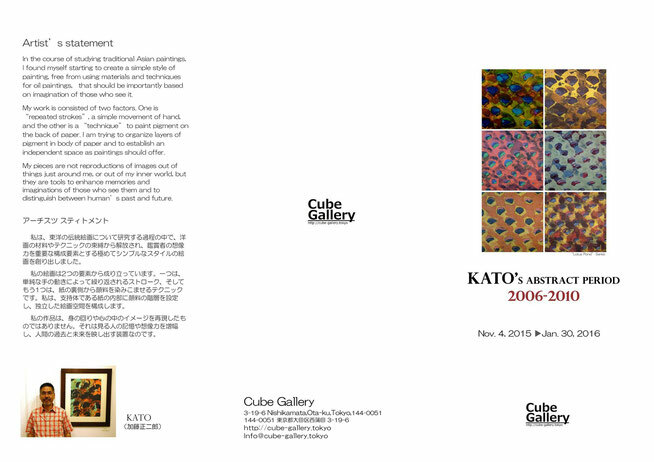 Now, Ho Chi minh City Fine Art Museum store a total 11 pieces of KATO's work. "Cat", "Rabbit" and "Boy". These works have been collection in three plants of TOYOTA Motor Corporation in Thailand.Also, Kato was asked by Toyota Group to produce a portrait of Mr. Akio Toyoda, President of Toyota Motor Corporation.It has been displayed in his president's office as memorabilia of TOYOTA Motor Corporation Thailand 50th anniversary. KATO got interviewed on TV at the opening of international art exhibition "20/20" at Bangkok Art & Culture Center in Bangkok. This exhibition celebrated the 20th anniversary of Akko Art Gallery's founding, exhibited artworks of 20 great contemporary artists from Thailand, Vietnam and Japan. KATO got interviewed on TV at the Biennale "BRIDGE 2009" at Akko Art Gallery in Bangkok. Biennale "BRIDGE" was an exhibition that KATO introduces Japanese artists organized in collaboration with Akko Art Gallery, Art Collector Mr. OGUSHI Yukio, to Asian art market. It was held four times from 2005 to 2011 under the support of Japanese companies such as Dentsu, Toshiba, TOYOTA Tsusho and Kinokuniya Book store. 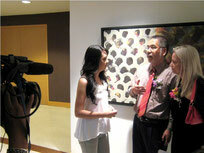 TV interview scene at KATO's solo exhibition "Lotus Pond" at Tu Do Art Gallery in Ho Chi Minh City, Vietnam. Tu Do Art Gallery is the oldest contemporary art gallery in Ho Chi Minh City , also famous in Asia and USA. KATO gave a lecture and practical instruction to students at the graduate school of art department of Xiamen University in China. During that stay, retrospective exhibition of KATO was held at the university's art gallery.